Porridge and Rice is strongly opposed to voluntourism. When volunteering, the purpose is to make a real difference to the communities and build awareness of the extreme poverty in Africa. Porridge and Rice does not make any money out of its volunteers. The single £200 payment we ask for is in recognition of the work done by UK volunteers to arrange the trips goes directly to the charity, as it is run entirely by volunteers with no single member of paid staff. Would you volunteer if you had no cameras with you? Porridge and Rice do a lot of things off-camera. When we take photos, it’s generally to raise awareness of what we are doing, and to show our sponsors and donors evidence of where their money is being spent. Photographs are taken with permission and are an important tool for spreading the word about the work the charity does. It is not about taking images of poverty and posing with small children in the slums. 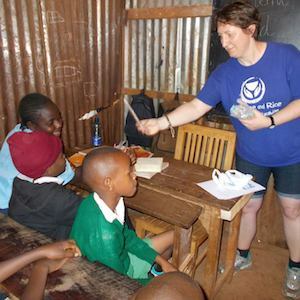 Porridge and Rice encourages volunteers to take pictures of their activities, both whilst volunteering in the slums and exploring Kenya to effectively promote the charity’s work and the beauty of Kenya. This, in turn, helps beneficiaries when donors see evidence of the work carried out and continue to donate. By sharing pictures of their trip with Porridge and Rice to friends and family back home, volunteers are able to create a dialogue about the useful work that is being done in Kenya. This increased awareness can lead to direct or indirect donations to the charity, engage family and friends in the UK in conversation, and work towards addressing the problems. Photos of the bustling schools and joyful children we work with, the living conditions in the slums, and the wider beauty of Kenya all help to promote the charity’s work. Porridge and Rice's Facebook page shows the wealth of interaction and proves the need of the meaningful projects the volunteers carry out. Porridge and Rice agrees that a volunteer should ask themselves why they are taking photographs and if the answer is ‘I want to take lots of photos for myself,’ then they should consider not volunteering with the charity abroad. They may still choose to help raise money here in the UK or help us in other ways as we always need volunteers in the UK having no paid employees at all. Are your intentions in the right place? Are you going overseas to help, or are you going overseas to look good to others? Do you want to help people, or do you just want to post a picture of yourself helping others for Facebook? Do you want to offer your skills to a community, or do you want to bulk up your résumé? If a volunteer’s intentions aren’t in the right place, they are unlikely to travel with us more than once. “I might break a nail” is never taken as a reason to slack off and, to our knowledge, has never been given as a reason for not doing something. Volunteering with Porridge and Rice is not just a holiday - meaningful work is the only work done and this is made clear from the initial planning stages for each trip. The charity encourages volunteers to go through their skillset (or potential) with one of the team before departure so that activities can be allocated that are both necessary to the community and make use of the volunteer’s skills. Nothing we do is unnecessary, all work carried out is for a reason, such as the painting of blackboards, which are essential elements of the teaching environment and not a token gesture. The volunteers will build them, paint them, hang them and they are used for the foreseeable future. We buy local goods and use local tradesmen to support the community, using their skill sets. All of the desks we funded were made by carpenters in the slums. Porridge and Rice make a real and tangible difference to the community. Volunteers are encouraged to see the need for themselves and respond to it and not just to react to the poverty and go away saying how terrible their lives are in the slums. “A single foreigner can save a community”, not entirely. The the joy of going out to Kenya with a charity like Porridge and Rice is that you are not a single foreigner but an extra pair of hands in an ongoing partnership working with the beneficiaries to maximise the long-term effect of the work that we are doing and of the money that we are spending. Does the agency have the same intentions and values that you do? How much of your money goes to the agency, and how much of it goes to your travel costs and your host charity? The only charge that Porridge and Rice make is an administration fee charged when individuals wish to volunteer with the charity out in Kenya. Volunteers cover their own costs of flights, insurance and accommodation. If further travel or safari holidays are arranged, the costs are passed on without mark-up. Volunteers are entirely self-funded, meaning that the charity makes no money out of the trips or the volunteers. All the work done in admin and planning in the UK is carried out voluntarily, there is no single member of the board or charity that received payment. Discounted safaris and white-water rafting are available from local businesses that know our charity and support the work that we do. The £200 admin fee charged is to cover local travel costs, administration and recognition of the school teachers on the ground who give up their time to accompany the volunteers and make them welcome and safe in Kenya. If someone refused to pay, we would be disappointed, but would not turn them away - to date no one has refused to pay, as they are made aware that the amount is a donation recognising the efforts involved. Our goal is that the volunteers make a meaningful contribution to the society and vulnerable communities as well as seeing the country of Kenya itself. We encourage them to see Kenya as the benefit to the tourist industry actually provides the locals and Kenyans in general with an income and employment. Tourism contributes to 10% of the employed population (wherein 64% are unemployed), so any money spent in the sector helps them to help themselves. To go there and contribute to the communities and the incomes of the people can help to make the volunteers experience even more unique and valuable. Does the agency promote community-led initiatives, or do foreigners look at the community and decide what’s best for them? 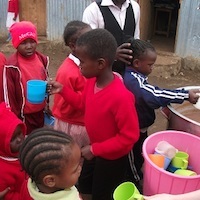 Porridge and Rice works in partnership with the schools it engages with in Kenya. The charity first started by asking the staff at Excel Emmanuel what their main challenges were, and worked onwards from there. 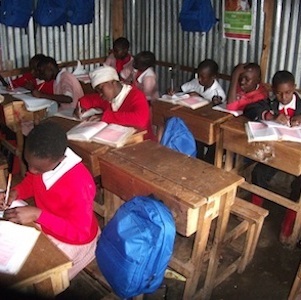 The core UK team work with the Kenyan schools’ leadership team to determine what their needs are, and where the donations made can be put to best long term effect. We made a deliberate decision to not set up our own schools, but were led by the committed individuals with passion and drive that are in the country and already have their own schools and specific skill sets. Where “foreigners” add value in this situation is in imagination, wider horizons, and having the time to work out how to get hold of the equipment and skills that are required to put the team’s ideas into effect. When we partner a school, we can enable the teachers and schools to develop their own initiatives, such as the Head Teacher at Compassion CBO who is now running a farming initiative and bringing in an income by selling produce locally. We have the advantage here in the UK of free education, skills and knowledge. We can and should endeavor to share this when there is a need, thus not creating a dependence and acting as a hand-out scheme which many charities do. Porridge and Rice runs a sponsorship scheme; each school matches the fees child for child and parents are required to work for their fees reducing the dependency and giving them the chance to earn their child’s education and maintain some dignity. Skills are developing in the leadership team which were not present in the beginning, we are now in the process of handing over responsibilities to the team members by registering the charity as a Kenyan charity so that they can take ownership of their future. We strongly believe in enabling them and giving them a sense of responsibility. If they offer the opportunity to work with children, do they do background checks to ensure voluntourists don’t have a history of abusive behaviour? If not, do you really think they care about the children they claim to help? Although our volunteers are helping out at schools, they are always accompanied by school staff or, at least, by other volunteers who are experienced and well known by the staff and communities. We could carry out DBS checks on all of our volunteers, however, we feel that, given the above strictures, it is an un-necessary overhead that would be costly in both time and effort. We have an enforced child protection policy which is read, discussed and signed by the staff in the partner schools and the volunteers. Are you going to be doing more harm than good? Be realistic about how your work will affect the locals. For example, research tells us that working with displaced children, especially orphans, is a bad idea for a voluntourist. Our volunteers do not work directly with vulnerable children: we are mainly seen as visiting guests of the schools and work with the teachers not instead of the teachers. We teach classes on health and hygiene, dental hygiene, nutrition, and other programme-related topics, in which case we could be seen in the same light as supply teachers. In all cases, lessons are carried out under the watchful eyes of the school’s staff, who often contribute themselves. The projects carried out by Porridge and Rice volunteers are well planned, and all have the long term strategic aim of improving the school’s infrastructure and ability to deliver a quality education. One example is the charity installing water tanks, we always make sure that if the school had to move, the tank could be taken with them. We also ensured there was adequate access for water delivery lorries otherwise the exercise would be futile. We are currently tackling the challenge of adequate toilet provision, but want to be sure that the solution is sustainable, and doesn’t leave the schools with the problem of yet another overflowing pit latrine. The partner schools who have worked with Porridge and Rice for more than a year have healthier children, larger numbers of children, and significantly improved facilities. Through the sustainability programme, the charity is trying to ensure that if we do have to cease partnership with the schools for whatever reason, they would still be significantly better off than if we had never been there. We are not giving any sort of hand-out, we are enabling and building an infrastructure that the school can continue. Porridge and Rice strongly disagree with working with orphanages as there are many aspects of these establishments that do more harm than good. For instance, the fact that many do not attempt reunion between surviving family members and the children which is extremely important for the future of an integrated and well-rounded community. We vet the schools that we are looking at forming a partnership with. In addition, we never hand over money and chose to provide goods and services which can be actively monitored to ensure that we reach the people in need and not line the pockets of corrupt individuals. We review the need and alter the input as this changes. Our sponsorship scheme for example, is more of a pool, the children that are in the most need remain in the scheme, but as their situation improves, they may leave the scheme and free up a spot for another child in need. Would you trust yourself enough to do this job in your own country? The tasks that volunteers are asked to do fit with their skill sets. 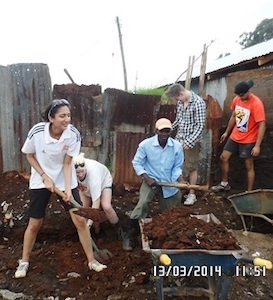 Some of the students have been asked to give lessons, IT professionals give computer tutorials, anyone with muscles has been employed as a labourer, either when re-routing sewers (a very pleasant job – if that doesn’t get you excited to come to Nairobi, nothing will) or when laying the concrete base for a new kitchen. Guidance is always provided and if a volunteer is willing and able to learn a new skill then they are taught to do so. We cannot afford to waste scarce resources by ‘doing a bad job’ and needing to redo work. If volunteers are willing to work hard, make a difference and be real team players, there is a high chance that new skills can be learnt. This was the case with the new blackboards; not one member of the team had painted a blackboard in the past, but would be able to do it in the future if needed. Where appropriate, for example, for building work, local labour is employed and paid a fair wage. This presents certain challenges itself, as Kenyans appear to work to a different timetable and sense of urgency than Europeans, however, it’s the right thing to do, so that’s what we do and continue to contribute to the community. Talking with former volunteers and current volunteers is the best way to find out what they learn and how the community and themselves benefit from this. In no way, do we limit the volunteers in what they choose to do, we ensure that all the work is done to the highest standard and is necessary. £10 pays for a place for 1 child for 1 month at a Porridge and Rice school.